If you’ve ever suffered a roof leak, you know what a problem it can be. There are many reasons that leaks can form, and the truth is that even the most structurally sound new roofs can have a problem after a few years on the job. Let’s explore the five leading causes of roof leaks so that you can keep watch for these issues and prevent them from happening at your property. 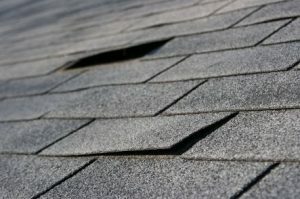 If you notice a leak inside your home, missing, cracked or loose shingles may be the culprit. Shingles have a pretty tough job to do, considering they’re exposed to the elements at all times. If you have asphalt, tile or clay shingles on your roof, it’s important to give them a visual inspection regularly to look for damage. Fixing a crooked shingle or replacing a few that were blown off in a storm can save you from a major headache down the road. Chimneys are vital ventilation structures, but are designed to extend through the roof at many homes and businesses. That means your roof needs to be properly sealed around the chimney to prevent water from getting in. The mortar could also crack in the brickwork of the chimney and allow water to penetrate into the home. Prevent chimney leaks by regularly checking the area around the chimney and take any crack in sealant or your chimney seriously – even a hairline crack – as it could quickly become a serious problem. Vents in your roof are often held together with rubber seals, and if they become lose or the rubber starts to erode, you’ll have a leak. Keep an eye on the roof area underneath these vents, and if you see signs of water, have it repaired quickly. Like chimneys, these are purpose-built holes in the roof, so make sure to check the area around vents regularly and take action at the first sign of any cracking, wear or damage. Valleys, according to Freshome, are the areas where two planes of your roof come together. They have to be sealed tightly, or rainwater and even leaves, sticks and other debris can collect behind them and cause a nightmare of a leak. Heavy rains and ice can cause valley leaks to happen more readily, so keep an eye on these sensitive areas. Ice dams occur when a ridge of ice forms at the edge of your roof, which prevents the melting snow from dripping off the roof. Water sitting idle on your roof’s surface can wreak havoc, leading to leaks. The longer an ice dam exists, the more time that water has to penetrate into and underneath roofing materials where it can refreeze, expanding and leading to greater damages. To prevent ice dams, make sure your roof is properly vented. If you see a dam forming, you can break it up with a roof rake or use an ice melting product, but be careful to choose a substance that is noncorrosive that won’t cause further damage to the roof. For more information on how to prevent roof leaks or to speak to the experts at Roofing by Bruce to have a leak fixed or your roof inspected, call us today at 570-424-7250.